U.S. Flag Store's Idaho State Flag is printed in America on Nylon flag fabric. Since this flag is made in America, U.S. Flag Store is able to ensure that the complex State emblems are printed with accuracy, sharp detail and bright colors. This outdoor Idaho State Flag is finished with the same high quality materials as all of U.S. Flag Store's US flags, and is extremely durable and long lasting. Design: A blue flag with the Idaho state seal placed in the center. Idaho's state motto "Esto Perpetua", which means "Let it be perpetual", is placed above the seal. Below the seal is a ribbon with the text "State of Idaho" written on it. Meaning: The state's seal signifies the importance of mining, agriculture, and forestry to the state of Idaho. The miner represents mining and mineral wealth, the wheat and fruit represent the state's agriculture, the elk is a sign of Idaho's wildlife, and the woman signifies "liberty, justice, and equality". Idaho joined the United States of America as an official state on July 3rd, 1890. Shortly after Idaho was made a state, the First Legislature of the state appointed a committee that was instructed to create a contest for the design of a state seal and offer one hundred dollars for the best submission. Artists from all over the country entered the contest, but a young woman by the name of Emma Edwards was awarded the prize for her beautiful design. Emma was originally born in New York and had only gone to Boise, Idaho to visit friends, but ended up falling in love with the city and staying there for the rest of her life. Emma was, and still is, the only woman to design a U.S. state seal. 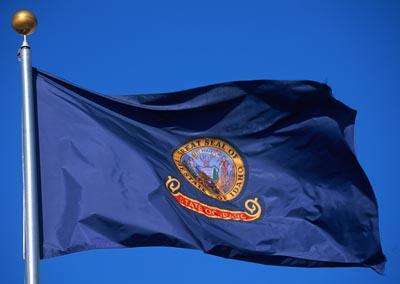 Just like many other U.S. state flags, the Idaho State flag first originated as a state military banner. After the United States Congress declared war against Spain in April of 1898, the U.S. Secretary of War sent word to each state asking for volunteer military troops. Idaho formed two battalions of infantry to form the Idaho National Guard, and they were deployed to the Philippines to fight in the Spanish-American War in May of 1898. Before the volunteer infantry left for the front lines, they were presented with a beautiful flag to represent their homeland of Idaho. The flag was created in Chicago by skilled needle-workers, and presented to the infantry by the women of Idaho. The flag they were presented with was a simple blue flag that featured a rendition of the Idaho Territorial Seal. In 1899, the Idaho volunteer infantry was sent home. When they arrived in San Francisco on August 29th they were greeted by over 100 Idahoans who had traveled to be there when the infantry arrived. A few years later, in 1907, the Idaho State Legislature began to think about a state flag and believed that the infantry's flag would work wonderfully. On Marcy 12th, 1907, Idaho legislation approved a replication of the infantry's battle flag the replaced their regiment's name with the text "Idaho". In 1957 a slight change was made to enhance the version of the Great Seal of Idaho on the flag, but the flag that still flies over Idaho today is generally the same one that was first approved in 1907.